It has been a difficult and shocking week and two dear friends of mines are having trouble for which i will continue to always have faith in and not give up on, after all the greatest friends are the ones who stick by even in the most difficult of times, and especially when not asked to. Sometimes the best thing to do is to occupy your body for the times your mind is unable to think straight. And so i decided to draw. I’m not much of an artist (especially in comparison to some of the people i know) but i can do something and i think at times they look nice. I have never pursued drawing as a career because at first i used to simply not feel good enough, but now i feel it is more of a hobby than a career. I may one day publish a comic book or a novel with illustrations (no not of you little monkey, ok maybe) or maybe even do some concept art or canvas paintings, but that’ll probably be it. Nevertheless drawing takes my mind and puts it deep into the imagination i hold so dear in that bizarre brain of mines. I’ve been told i am good at drawing since i was a little sapling, i used to win merits, and awards and even had some art of mines exhibited in museums. I think that if i kept it up as a primary course in every school, college and at university i would be much better now but then i love to do too many things. Literally all the navigation links above i have some sort of a passion for, including the not yet named error. Currently i can draw fairly ok, but only using references. If you tell me to draw without any references then what i draw will not come out very well. It may simply be because i haven’t really practiced as much, i haven’t done life drawing which i would like to, nor have i focused on it as a primary passion. Because you don’t become a great artist with talent alone, it takes a lot of hard work. 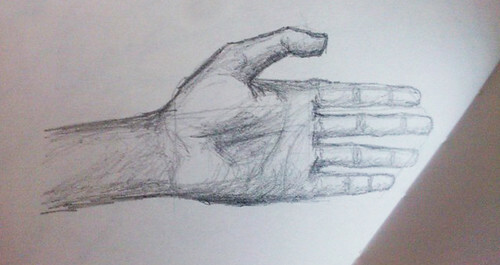 Below are drawings of left hands, why left hands? Because i’m right handed. The one on the left has been drawn without a reference, whereas the one on the right was drawn using my own left hand as a reference. Spot the difference. Good thing is i can often use references and alter them as i draw, such as my previous drawing post of the person singing. After all i don’t want to be replicating the picture and most likely making a much worse representation of it haha. But then again sometimes the point is to replicate. I guess one of the next things i would like to do is digitally colour my drawings. Currently i have only done one digital drawing and it came out somewhat ok, but i guess after a few hundred years i should be a master. In the meantime i am going to make some shader spheres to practice getting the different colours right and working with highlights and shadows. I will also soon be receiving a modern take on the Camera Lucida (room of light), a piece of technology used throughout the 19th Century as an indispensable tool for drawing masters and this day it is hardly known of. A team of two decided to put together a modern version known as a NeoLucida and this is what i will be receiving soon and it’ll be interesting to see what i can do with it, besides chewing on the lens. Although i draw, i also do creative writing, video production and soon to be voice acting and you will see more of these soon. This entry was posted in Graphics and tagged art, digital art, drawing, imagination, Lucida, NeoLucida, referencing, together, Wacom Bamboo. Bookmark the permalink.